Mezmaiskaya Cave (Russian: Мезмайская пещера) is a prehistoric cave site overlooking the right bank of the Sukhoi Kurdzhips (a tributary of the Kurdzhips River) in the southern Russian Republic of Adygea, located in the northwestern foothills of the North Caucasus in the Caucasus Mountains system. Initial excavations in the Mezmaiskaya cave recovered Mousterian artifacts of the Last glacial period. The Late Middle Paleolithic stratigraphic layers at Mezmaiskaya are composed of 7 layers, dating from roughly 70,000 to 40,000 BP. Three Neanderthal individuals were recovered from the cave. The first, Mezmaiskaya 1, was recovered in 1993 and is an almost complete skeleton in a well preserved state due to calcite cementation that covers and holds the arrangement in place. It was assessed to be an infant about two weeks old, making it the youngest Neanderthal ever recovered. Although no burial pit was found, circumstances suggest that the body was buried intentionally, explaining the good state of preservation and the lack of scavenger marks. Mesmaikaya 1 was recovered from Layer 3, the oldest Late Middle Paleolithic layer at the site. Mezmaiskaya 1 is indirectly dated to around 70-60,000 years old. Additionally, 24 skull fragments of a 1-2 year-old Neanderthal child - Mezmaiskaya 2 - were found in 1994. A recovered tooth was assigned to Mezmaiskaya 3. Mezmaiskaya 2 was recovered from Layer 2, the youngest Late Middle Paleolithic layer, and directly dated to around 44,600-42,960 BP. DNA analysis reveals that Mesmaiskaya 2 was male. Ancient DNA was recovered for a mtDNA sequence showing 3.48% divergence from that of the Neanderthal 1, found some 2,500 km (1,600 mi) to the west in Germany. Phylogenetic analysis places these two specimen in a clade distinct from modern humans, suggesting that their mtDNA types have not contributed to the modern human mtDNA pool. Mezmaiskaya 2 is genetically closer to other late European Neanderthals, including Neanderthals from Vindija Cave, Spy Cave and Goyet Caves, than the older Mesmaiskaya 1, which indicates that a population replacement of Neanderthals likely occurred in the Caucasus. This gap in time is consistent with Marine isotope stage 3. Modern humans and Ust'-Ishim man share more alleles with all other Neanderthals, including Mezmaiskaya 1, than with the Altai Neanderthal from Denisova Cave, which shows that the introgression event from Neanderthals into humans likely took place after the split of the lineage of the Altai Neanderthal from that of other Neanderthals, but before the split of the lineage of Mezmaiskaya 1 and that of other Neanderthals. Faunal remains show a very low degree of weathering, with many bones having traces of stone tool cuts and carnivore modification. The most common large mammals are steppe bison (Bison priscus), Caucasian goat (Capra caucasica), and Asiatic mouflon (Ovis orientalis). Reindeer (Rangifer tarandus) remains were encountered for the first time in the Caucasus. Although most of the smaller vertebrate remains appear to have been accumulated by nonhuman processes (for example, owl predation), the majority of the ungulate remains probably represent animals hunted by the occupants of the Mousterian culture. The cave entrance is a hole in the cliff several meters high, behind which the course is narrowed to a few meters, but almost all along remains quite high. Within a few tens of meters of the entrance to the cave, the floor is transformed from rocky to clay. Evidence recovered from the cave suggests that the Campanian Ignimbrite eruption around 40,000 years ago may have been a setback for the Neanderthal, with an as yet only postulated eruption contributing to their demise about 29,000 years ago. ^ a b c d e f g Hajdinjak, Mateja; Fu, Qiaomei; Hübner, Alexander; Petr, Martin; Mafessoni, Fabrizio; Grote, Steffi; Skoglund, Pontus; Narasimham, Vagheesh; Rougier, Hélène; Crevecoeur, Isabelle; Semal, Patrick; Soressi, Marie; Talamo, Sahra; Hublin, Jean-Jacques; Gušić, Ivan; Kućan, Željko; Rudan, Pavao; Golovanova, Liubov V.; Doronichev, Vladimir B.; Posth, Cosimo; Krause, Johannes; Korlević, Petra; Nagel, Sarah; Nickel, Birgit; Slatkin, Montgomery; Patterson, Nick; Reich, David; Prüfer, Kay; Meyer, Matthias; Pääbo, Svante; Kelso, Janet (2018). "Reconstructing the genetic history of late Neanderthals". Nature. doi:10.1038/nature26151. ISSN 0028-0836. ^ L. V. Golovanova, John F. Hoffecker, V. M. Kharitonov and G. P. Romanova, Mezmaiskaya Cave: A Neanderthal Occupation in the Northern Caucasus Current Anthropology Vol. 40, No. 1 (February 1999), pp. 77-86 . ^ John Hawks and Milford H. Wolpoff, Brief Communication: Paleoanthropology and thePopulation Genetics of Ancient Genes AMERICAN JOURNAL OF PHYSICAL ANTHROPOLOGY 114:269–272 (2001) page 269-272. ^ L. V. Golovanova, John F. Hoffecker, V. M. Kharitonov, and G. P. Romanova, Mezmaiskaya Cave: A Neanderthal Occupation in the Northern Caucasus, Current Anthropology Volume 40, Number 1 | February 1999 73. ^ Есть вопросы? 21 февраля петербуржцы смогут задать их нашим Экспертам лично. ^ Скелет новорожденного неандертальца проливает свет на эволюцию рода Homo. ^ mtDNA of Okladnikov Neandertal PNAS February 11, 2014 vol. 111 no. 6 . ^ Igor V. Ovchinnikov; Anders Götherström; Galina P. Romanova; Vitaliy M. Kharitonov; Kerstin Lidén; William Goodwin (30 March 2000). "Molecular analysis of Neanderthal DNA from the northern Caucasus". Nature. 404 (6777): 490–493. doi:10.1038/35006625. PMID 10761915. Retrieved 13 March 2011. ^ L. V. Golovanova; John F. Hoffecker; V. M. Kharitonov; G. P. Romanova (February 1999). "Mezmaiskaya Cave: A Neanderthal Occupation in the Northern Caucasus" (PDF). Current Anthropology. The University of Chicago Press on behalf of Wenner-Gren Foundation for Anthropological Research. 40: 77–86. doi:10.1086/515805. JSTOR 10. ^ Ни о каких контактах неандертальцев и сапиенсов в Европе говорить не приходится. Kebara Cave is an Israeli limestone cave locality in the Wadi Kebara, situated at 60 to 65 m above sea level on the western escarpment of the Carmel Range, in the Ramat Hanadiv preserve of Zichron Yaakov. The cave was inhabited between 60,000 and 48,000 BP and is famous for its excavated finds of hominid remains, made under the direction of Professor Ofer Bar-Yosef. Spy Cave is located near Spy in the municipality of Jemeppe-sur-Sambre, province of Namur, Belgium above the left bank of the Orneau River. Classified as a premier Heritage site of the Walloon Region, the location ranks among the most significant paleolithic sites in Europe. The cave consists of numerous small chambers and corridors. Axlor is a prehistoric archeological site in the village of Dima in Biscay in the Autonomous Basque Community of Spain, dating from the Middle Paleolithic or Mousterian period. Peștera Muierilor, or Peștera Muierii, is an elaborate cave system located in the Baia de Fier commune, Gorj County, Romania. It contains abundant cave bear remains, as well as a human skull. The skull is radiocarbon dated to 30,150 ± 800, indication an absolute age between 40,000 and 30,000 BP. It was uncovered in 1952. Alongside similar remains found in Cioclovina Cave, they are among the most ancient early modern humans in Romanian prehistory. The Sidrón Cave is a non-carboniferous limestone karst cave system located in the Piloña municipality of Asturias, northwestern Spain, where Paleolithic rock art and the fossils of more than a dozen Neanderthals were found. Declared a "Partial Natural Reserve" in 1995, the site also serves as a retreat for five species of bats and is the place of discovery of two species of Coleoptera (beetles). 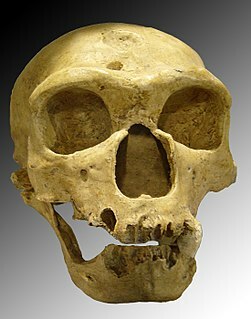 Neanderthals are an extinct species or subspecies of archaic humans in the genus Homo, who lived within Eurasia from circa 400,000 until 40,000 years ago. Scladina, or Sclayn Cave, is an archaeological site in the Andenne hills in Belgium, where excavations since 1978 have provided the material for an exhaustive collection of over thirteen thousand Mousterian stone artifacts and the fossilized remains of an especially ancient Neanderthal, called the Scladina child were discovered in 1993. The Mladeč caves are a cave complex in the Czech Republic situated to the west of the village of Mladeč in the Litovelské Pomoraví Protected Landscape Area. the Kurdzhips River located in The Caucasus Mountains, is a river in the Absheron district of Krasnodar region, Russia.